While the Apple Watch Series 3 officially launches September 22 in the first wave of countries, those interested in Nike+ models will have to wait a bit longer. In fine print, Apple announced that new Series 3 models of Apple Watch Nike+ will be available in limited quantities starting Thursday, October 5. Apple Watch Nike+ pre-orders still start September 15 like regular Series 3 models. 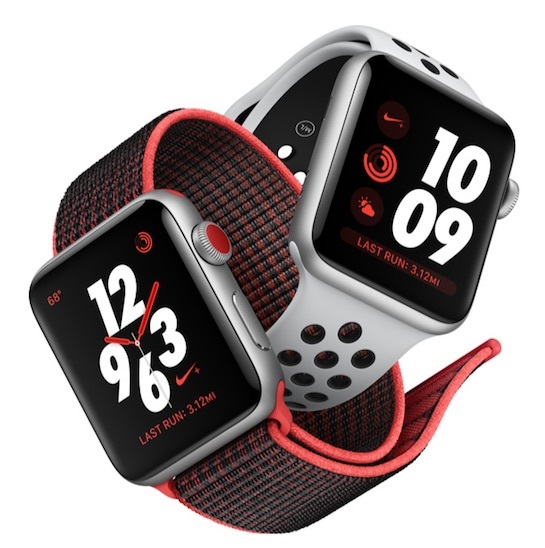 Apple Watch Nike+ comes with all the features of Apple Watch Series 3, including cellular, which lets you take calls, send messages, and soon stream Apple Music without needing to pair the watch to your iPhone. Apple Watch Nike+ models are priced between $329 and $429 in the United States. Additional Nike+ bands are $49 each. Launch countries include the United States, Australia, Austria, Belgium, Canada, China, Czech Republic, Denmark, Finland, France, Germany, Greece, Guam, Hong Kong, Hungary, India, Ireland, Italy, Japan, Kuwait, Luxembourg, Macau, Monaco, the Netherlands, New Zealand, Norway, Poland, Portugal, Puerto Rico, Qatar, Russia, Saudi Arabia, Singapore, Spain, Sweden, Switzerland, Taiwan, Thailand, Turkey, the United Arab Emirates, and the United Kingdom. Why can't they offer a wider mix of band colors? That red dot makes a lot of sense for the Nike Model or even a Target limited edition model.